Unless I stand up and move around, the view from my office is mostly that of grey skies, rain, other office buildings, plus one architectural delight. But, on my windowsill. . . Very gorgeous. I can also tell by that building that you're really close to where my husband works! Huh? I thought you worked on the Eastside! I saw that grid and thought SPL Central, but figured it had been copied elsewhere. Cool! 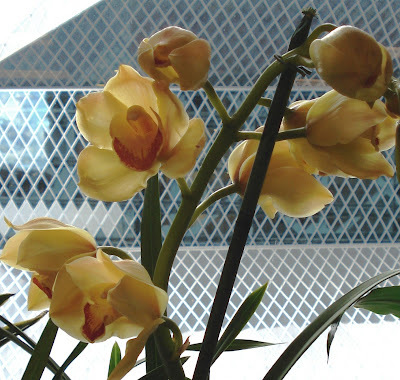 What type of orchid, do you know? I haven't seen that color before. Reminds me a little of your prolific peaches.